Popped in for a quick one while on a short visit to Oakham. Sat in the garden while sipping a pint of Tiger. A pleasant, peaceful experience in the summer sun. The Wheatsheaf is a quiet Everards pub with a bar, a lounge and a nice conservatory area that connects the two. The garden at the rear looked as if it could make a pleasant spot for a beer on a summer's day. Everards ales on were Tiger, Sunchaser, Beacon & Original. They also had Adnams Bitter, Batemans XXXB & Westons Rosie's Pig. Nice pub, if not a bit too quiet. From here, I moved onto the Lord Nelson (not listed on here) and I have to agree with the two previous reviewers that it is the best pub in town. It was certainly my favourite pub of the day in Rutland. I will request for it to be added. 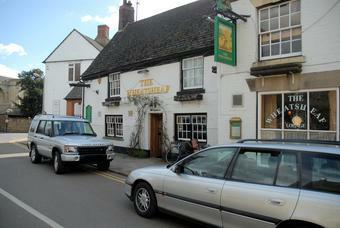 Oakham isnt blessed with numerous pubs, but the ones it has are all pretty good.. The Wheatsheaf is a charming Everards pub, with a nice atmosphere and a feeling that it is maybe 10 years behind the times (quite dark with horse brasses etc...). When I visited in October 13 on a saturday afternoon it was pretty quiet, and beer choice was limited (Beacon, Tiger & Green King). We did however play dominoes in front of a nice open fire and there is nothing wrong with the pub at all. We stayed @ The Admiral Hornblower, which is also recommended, and has great food, beer and accomodation (The four poster room 4 was lovely). I'm guessing The Lord Nelson is pretty safe, but everybody else needs to watch out; It's the old debate - JD Witherspoon - Saint or sinner? Like the other, older and more established pubs in this town, The Wheatsheaf's trade has suffered from the outstanding success of the Lord Nelson, which opened its doors in December 2011 and has not looked back since. With the Nelson's excellent range of well-kept ales and delightful service, The Wheatsheaf, once humming with local life, is struggling to survive..
Everards have entertained plans to revamp the pub and attempt to establish it as a flagship gastro-pub, but the tenancy is on the market and there are even rumours that it may close.